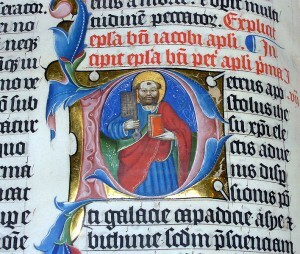 In the course of the publication of my articles on Latin and the Catholic Church’s memory and identity (part one, part two, part three, part four), commentator “Michael” posed the question, “Can Catholics figure out, by Natural Law alone, the ‘goodness’ or ‘badness’ of some writing?” He also made the claim that, “…in removing the positive law associated with the Index, the pope [Paul VI] essentially moved the prohibition from ‘Secondary Natural Law’…to ‘Primary’….” I address here these statements. One of the first documents awaited from a new Pope is his first Encyclical. This is because it is believed that a Pope’s first Encyclical contains a “blueprint” for his pontificate. Pope Paul V’s first Encyclical was Ecclesiam Suam (ES) of August 6, 1964. In it, he provides an outline of his thinking and his hopes for his pontificate, which was intricately bound up with the Second Vatican Council. In ES, Paul VI took for his own Pope John XXIII’s principle of “aggiornamento” (“updating”). [i] This principle was deeply rooted in John XXIII’s undying belief in the inherent goodness of man and the superiority of the Church—the latter understanding having sadly fallen into oblivion. [ii] As the successor of John XXIII, there can be no question that Paul VI held to this spirit. My previous article series offers further information with respect to this implementation and so the reader is referred to them. Particular attention should be paid to the “para-Council” spoken of by Bishop Fabian Bruskewitz and the efforts made to stymie the appropriate implementation. Before continuing, I wish to issue a disclaimer: I am not a canon lawyer. What is offered here are considerations from my research on the Church’s theology of private revelation. I am to be understood as coming from that background and not strictly from canonical studies. The above in mind, let us turn to the statements being addressed in this article. The first is the question whether or not a well-formed Catholic can figure out (based only on Natural Law) the “goodness” or “badness” of some writing. Secondly (and also implied in the question) there was a claim that Paul VI collapsed “Secondary Natural Law” into “Primary Natural Law.” These statements are essentially driving at the same point which I will address. To say that Paul VI collapsed meanings of Natural Law is an error. This is so not only because it “opens a can of worms” with respect to the doctrine of Original Sin and/or Paul VI’s practical adherence to it but because it does not take into consideration the entire history of the Holy Father’s reforms to ecclesiastical censorship. Paul VI did not want the duty of protecting from matter harmful to faith and morals to fall squarely upon one group in the Church (i.e. Rome). He desired that the entire people of God (hierarchy and laity) be mindful of their moral obligations in this regard. For the laity, he spoke of the “mature conscience of the faithful” (fidelium maturae conscientiae) and for the Bishops, he called for their “vigilant solicitude” (vigili sollicitudine). To be clear, Paul VI reformed the system of censorship and did not abolish it. He expected Bishops to maintain a “vigilant solicitude” and instruct the faithful entrusted to their care. The faithful, for their part, were expected to have informed consciences, which would only come from reading, studying the Faith and obeying their Pastors. Rome, of course, would also continue to exercise its right of censorship (and has). One can again see the “well-greased” motif mentioned earlier, implying that Bishops and laity cooperate with Divine and Natural Law. Heaven help us if they do not. In conclusion, Paul VI maintained that censorship was to continue in the Church. Because of this it is groundless to say that he collapsed Secondary Natural Law to that of Primary. Rather, the Holy Father’s reforms expected of Bishops to fulfill their duties and the willing cooperation of the faithful with their Pastors as well as to study and inform themselves of the divine precepts. Have the desires and will of the Roman Pontiff been carried out? I leave that to the reader to decide. [ii] There is an often quoted saying of Pope John XXIII that goes, “The Church has no enemies.” <http://query.nytimes.com/gst/fullpage.html?res=9505E7DD123AF933A25755C0A96E958260> (Accessed 23 March, 2011). Within the context of Communism, John XXIII’s remark was about the superiority of the Church over error and falsehood and that Catholics need not fear these. For some context of the remark, I refer the reader to Christian Feldman, Pope John XXIII, A Spiritual Biography. (New York: The Crossroad Publishing Company, 2000), 122. See also <http://lasa.international.pitt.edu/members/congress-papers/lasa2009/files/HolbrookJoseph.pdf> (Accessed 23 March, 2011). [iii] A famous statement to this effect was the Holy Father’s “smoke of satan” remark of June 29, 1972: <http://www.vatican.va/holy_father/paul_vi/homilies/1972/documents/hf_p-vi_hom_19720629_it.html> (Accessed March 23, 2011). See also a follow-up to this comment by Cardinal Noe in a 2008 interview <http://wdtprs.com/blog/2008/05/petrus-amazing-interview-with-card-noe-paul-vis-smoke-of-satan-remark-concerned-liturgy/> (Accessed March 23, 2011). [iv] C.f. the Decree of the Congregation for the Doctrine for the Doctrine of the Faith (CDF), “Post Litteras Apostolicas” (PLA) of June 14, 1966. It is available in the Acta Apostolicae Sedis (AAS) Volume 58, 1966, p 445 as well as online in .PDF format: <http://www.vatican.va/archive/aas/documents/AAS%2058%20%20-%20ocr.pdf> (Accessed March 23, 2011). [v] Much of that structure can be found in the March 19, 1975 Decree, “Ecclesiae Pastorum” issued by the CDF. See also the two documents entitled “Ratio Agendi” of January 15, 1971 and May 30, 1997 also by the CDF.